Did you know that you could volunteer with Habitat for Humanity without ever stepping foot onto a construction site? That’s right, people of all ages can volunteer at The Habitat for Humanity ReStore! Functionality Tech: In this role, you will sort, test, clean, price, and display donations of electric items. We will provide basic training on how to test these items, as well as training on how to price the items so that they will help generate revenue for the ReStore. Interested Functionality Techs should be confident in working independently but not afraid to ask questions when something new comes through the door. Prior experience with electronics is welcome, but it is not necessary. Knick Knack Knowledgetarian: In this role, you will sort, clean, assess and research, price, and display donations of household goods. Knick Knack Knowledgetarians should be comfortable working independently, as well as in collaboration with others. They must also be able to pay attention to details. Familiarity with antiques and collectibles is desirable, but little to no knowledge of these items is OK with us (that’s why we work as a team)! Entertainment Enthusiast: In this role, you are charged with assessing, cataloging, and displaying media items. Interested Entertainment Enthusiasts should be confident in working independently and be able to pay attention to detail. They must also be comfortable working in a warehouse setting. No prior experience in media sales is necessary, but knowledge of popular music and films is desired! Information Officer: In this role, you will manage the ReStore’s customer service desk by answering in-store and phone questions, filling out paperwork, and providing resources to customers. Interested Information Officers should be comfortable interacting with people and be able to maintain a polite and friendly demeanor. They should be confident in retaining information and working independently but willing to ask questions when something is unknown. No prior experience in customer service is necessary to become an Information Officer! Merchandising Maniac: In this role, you will manage and display ReStore merchandise on the store’s sales floor, and you will assist customers with their questions and requests. Interested “Maniacs” should have an eye for detail and a creative mind. They should also be comfortable standing for the majority of a shift and retaining information about the store’s policies and layout. It is desirable for Merchandising Maniacs to be able to move lightweight- to-moderately-heavy items, but this is not required. And that’s not all! Whether you prefer cleaning dishes, hanging pictures, or researching that strange, wooden “thingy” that just came through the door, we’d love to have you join our team! To learn more about the volunteer program at the Habitat for Humanity ReStore, please contact the Volunteer Program Manager, Amanda Casella, via email, acasella@restoredurhamorange.org or visit our website. Please note that all of these specific roles require additional training, and a minimum 3 month commitment. 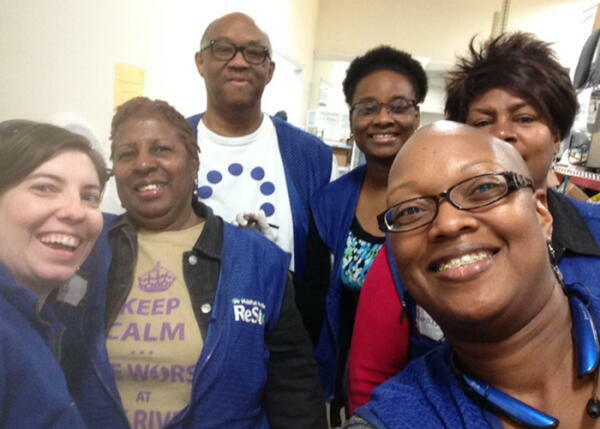 Thanks to the ReStore's Communications Manager, Caitlyn West, for writing this blog post! This is part three in a series about the Orange Durham ReStore. Click here to read the first post about the history of the ReStore. Click here to read the second post about donating to the ReStore.